In February 12 people died as a result of vehicle accidents among them 8 pedestrians, 1 cyclist, 1 passenger and 2 drivers. This is the lowest number of monthly traffic fatalities in more than a year. 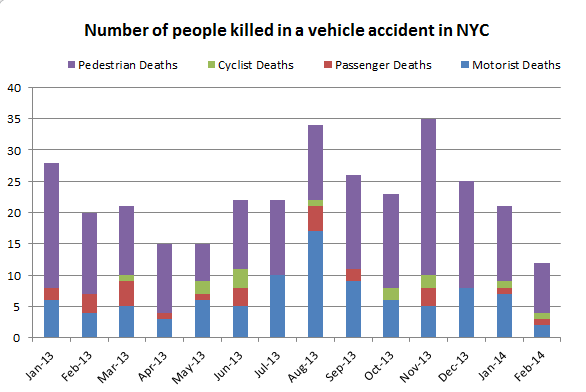 Last month a total of 21 people died in traffic accidents in NYC and a year ago in February 2013 there were 20 deaths. It is too early to see a trend however it looks like the first Vision Zero initiatives may have helped to make NYC streets safer in February. We’ll see in the coming months if the trend continues. 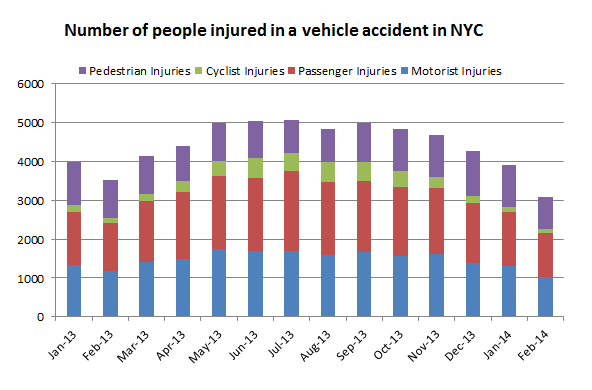 The number of people who suffered personal injury in a traffic accident in NYC was also lower compared to the previous month and compared to the same month a year ago. 820 pedestrians were injured in traffic accidents last month and 8 of them died. This is progress compared to the previous month and compared to the same month a year ago however this is still too high and more efforts have to be made to achieve “Vision Zero”. 1 bicyclist died and 94 were injured in February. Here too we can do better! 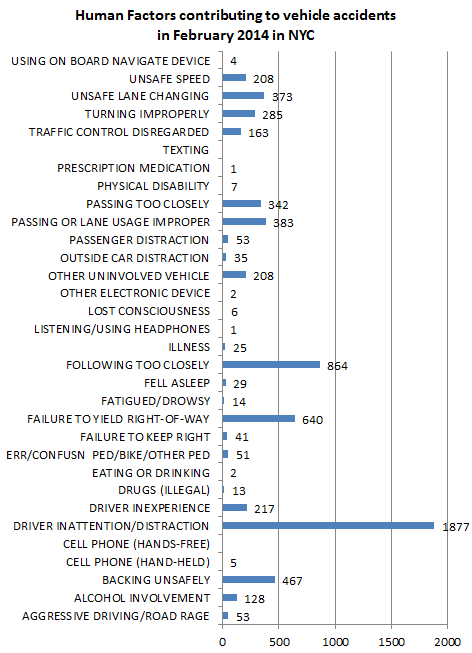 Careless drivers are still the main culprits with most accidents in February being related to distracted driving, following too closely or not yielding the right-of-way.